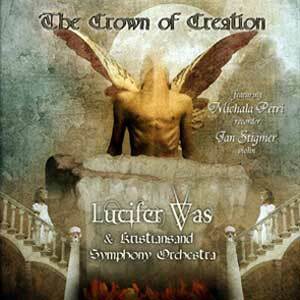 Lucifer Was - "The Crown of Creation"
Lucifer Was is a very old Norwegian act (starting in 1970) that took a long break but in the last 10 years has made many records and this latest one is a sort of rock opera and even includes a full symphony orchestra. In fact the orchestra parts were all composed and recorded first and then the rock band played over the top of the orchestra stuff later. The CD also features Jan Stigmer on violin and famous flutist Michala Petri. The opening track Wonder is a very cool and heavy track with organ and flute and intense vocals. Three Hammers, is a short dramatic orchestrated piece with intense violin, which fades into Unformed and Void. This is a beautiful melodic track with backing orchestra as well. All the tracks are orchestrated with the band playing over the top on a lot of the tracks, while some tracks are mainly vocalist Jon Ruder and just the orchestra. Fans of melodic and beautiful progressive rock will be drawn to this record on the creation of the world (and fortunately not a religious record). This is a radical departure from all the bands other records but a very successful melding of classical music and rock and an interesting story.